"If a restaurant had a thousand tables and there where a thousand magicians performing, one for each table, all the people would want to be at Carl's table...including the other 999 magicians. Carl is that good." "The advice is excellent, and is the kind of information that can only be obtained through experience. In fact, Carl offers one suggestion that was new to me, and which I have immediately incorporated. " "Here's fine advice from a working pro who really knows what he's talking about." "It's a rare treat to learn from one of the true masters who makes his living doing this stuff for real people. Carl's as good as it gets." "A must for those wanting to learn practical material"
"Swaying palms, hot white sand, sun-kissed shores . . . This is where Carl Andrews makes his very good living! Now he's giving up his marketing methods for us mere mortal mainlanders. Run, do not walk, and take his advice! Who knows, maybe you too can get your own island one day." "I have seen this material performed in the "real world" for amazed audiences. It is my kind of magic: practical, "working pro's" material that is within the reach of every performer. This is material used regularly to "wow" both the Hollywood celebrity crowd and the high-end Hawaiian tourist trade." "I like them both! It's always a pleasure to see stuff that's not pipe dreams and closet magic. This is clearly material and advice from a performing magician who knows his job!" "Very good. One can really see you are a worker, the practicality is obvious." "Anything Carl puts out should grab the attention of anyone who hopes to be a successful magician." "No pipe dreams here. Carl gives you the real work on performing for real people in the real world. That's what everyone is looking for, and that's what Carl delivers"
Déjà vu - Swain’s airmail card combined with the Two Ton Transpo. Climaxes with the Sankey idea of a card appearing on a paper clip that’s been in full view the entire time. Carl also tosses in some great ideas on maintaining a two-card stack. The World Famous Two Coin Trick - Hopping Half without having 40 bucks ‘hop’ out of your pocket - he does it with real coins! The coins can be examined at the beginning without having to sacrifice anything visually during the routine. You Don’t Know Jack - Another line I use incessantly. This time it’s the title for Carl’s version of Mike Close’s Frog Prince. If you don’t already perform this, you’ll want to start. Carl has brought some great ideas to the table for this great “non card” card trick. Amazing - You’ll fast forward to the explanation. Picture Perfect - The selected cards develop on two blank cards. Really liked the video, the routines and advice are superb. Carl Andrews, Jr. is a consummate professional and here are seven snappy routines developed and tested under fire in real life performance. This is a new video by Carl Andrews, Jr. Carl lives and performs in Hawaii, and has lectured at the last three IBM conventions held each year in Hawaii in March. He is an accomplished professional, with lots of experience in walk around, table-hopping, and magic theatre. This video deals primarily with table-hopping in restaurants, and how to build and maintain a reputation performing this type of magic. The photographic and sound quality are excellent, the performance and teaching are excellent, and the tips section is even better than that. If you have wanted to do table-hopping, have read all the latest books on the subject, but found yourself still wondering how you actually find a good restaurant, sell yourself, and handle the minute details of actually doing this kind of work, Carl's video will provide straight forward answers to most of your questions, and give you the courage to get out there and do it. I’d like to pass on some information about a book and video that you should REALLY check into.... the book is entitled “Making a Living In Magic Performing at Restaurants and Hotels” and the video is entitled “Making a Living Performing Close-Up Magic”. Both are by Carl Andrews, Jr. from Hawaii. I do not have anything to do with either project other than thinking that these are worth everyone’s attention. Both are SUPERB and are definitely on my top ten GREAT purchase list for quite some time. I bought the book and manuscript initially for the material but let me tell you... it’s a whole lot more. There is some of THE best advice I’ve heard in a long time (and I’ve been doing table and strolling magic for 19 years). AND the material is out of this world... VERY practical, VERY usable, VERY strong, and VERY good. Don’t even hesitate... as you won’t be sorry. This stuff is SUPERB. I predict the book and video will be huge sellers due to the amount of great, workable material and the superb advice. Being familiar with Carl's other two videos and book, I just knew this video would be full of great, practical material. I was not disappointed. It is nice to get material from a magician who has who has used and tested the effects in real world situations before passing it on in a video. I think that is what I like most about this video. The fact that Carl has tried and perfected the material for real people in the exact situations that it is meant to be used... strolling. 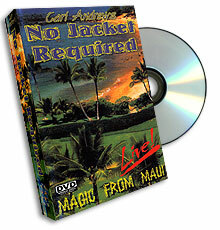 Another nice touch is that you get to see Carl perform the material at the resort that he works at regularly in Maui. You get to see the effects performed and you get to see the real reactions. No studio. The explanations are as clear as they could possibly be. Shot in a studio with great camera work and every effect carefully explained with Carl's personal tips and thoughts on each effect. Practical, usable material that any close-up or strolling magician will get a lot of use out of. Highly recommended. since each of them is very entertaining and involve the spectator. 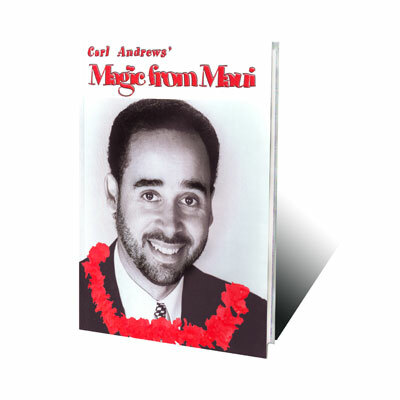 If you've just started out working in restaurants or strolling at parties, or are thinking about working in those venues, or want to add some other effects to your repertoire to add variety to your act, buy Carl Andrews' book, ‘Magic from Maui’. You have to have it. That's it. End of review. Okay, so that's not the end of the review. But what I said wasn't hype, either: this really is one book anyone having any connection with restaurant or strolling work cannot be without. ‘Magic from Maui’ is one of those rarest of rarities: it's a book that delivers the goods and then some. Although I hesitate to say it, this is one book you could build an entire act from, then build your business -- and your reputation -- from that act. And Andrews even helps you out doing that. This is an absolute winner. Cards, coins, cups and balls, dice... Andrews has it all here. And you can forget about things like huge resets or angles or carrying around half of the local hardware store in your pants pocket. Andrews material is solid, craftsman-like stuff for the strolling and restaurant magician. And don't even get me started about the wealth of great, common-sense material on working restaurants in the first place. Andrews' writing style is clear and concise and with a delightful eye on the performing nuances; it's extremely easy to read and learn from. There'll be no problems learning the effects from Andrews' work. Line drawings by Tony Dunn which are wonderfully done and beautifully placed, complimenting and Andrews' writing superbly. This is what Andrews' material is all about. Remember, we're talking basically about ‘hit-and-run’ magic when you're talking table-hopping and strolling, and to pull that off presentations have to be short, crisp, and easily remembered. Andrews' presentations are full of that thinking, pulling the spectator into the trick as quickly as possible and keeping everything nice and visual besides. Yes, there are some takes on the classics here, but Andrews' does a superlative job taking those and adapting them to his way of doing magic. From the classic ‘Hopping Half’ and ‘Scotch and Soda’ plots (done without gimmicks) to a short and startling Cups and Balls routine to a clever approach to Card-on-Ceiling, Andrews fills his work with what works for him. Luckily, these original takes -- and the thoroughly original work besides -- will work for most anyone, anywhere. Date: Saturday, 21 September 2002, at 10:03 p.m.
Carl Andrews, for those not 'in the know', is one of the gentlemen who started Illusions restaurant and is one of the greats of restaurant and strolling magic. 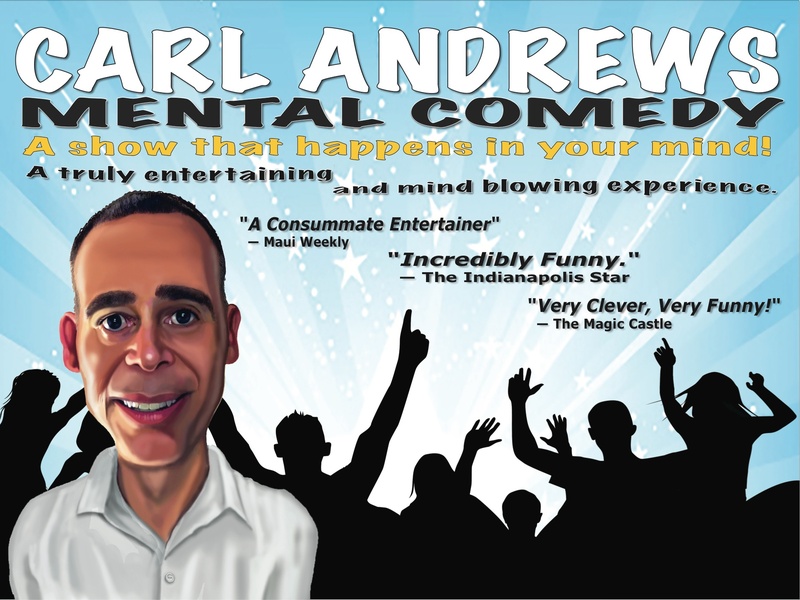 Carl also does comedy and stand up magic as well and presently works for one of the major cruise lines having left a top resort in Hawaii after a number of years. His previous videos, the latest before now being No Jacket Required, are really of value to close up and in particular restaurant magicians. Carl really knows what magic works and has performed for thousands upon thousands of spectators. 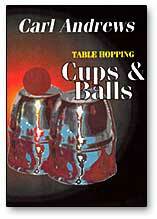 I think this is one of the best cups and balls routines I've seen. I think this is absolutely the best one for performing table side or at the bar for a few folks in front of you. Much respect to Vernon and Ammar etc. but I'm looking at this from the perspective of a non-magician (hard but I can handle it) and while I can applaud the wonderful Dai Vernon wand spin (Wes James, forgive me since I forgot who else should be credited for the spin), which isn't used here, for real people the goal is to entertain and mystify and Carl does it. The Pocket-Pocket is a pocket organizer for your trouser pocket. It turns your trouser pocket into 8 pockets to easily organize your effects while performing. No more searching thru your pocket to find props, with the pocket-pocket, you know where everything is located. 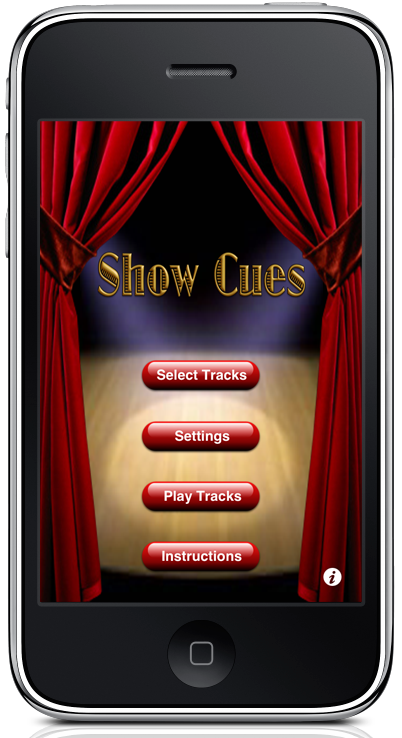 The official magic App of Professional Magician and Mentalist Carl Andrews. There are 6 simple yet amazing effects that you will enjoy performing for your friends. All the effects are self-working. There is nothing to learn, just have fun!